This two-tone vest features a 2", Level 2 ANSI-certified 3M® Scotchlite® tape with a 4 1/2" contrasting color for maximum worker visibility. And for convenience, there's an inside pocket and zipper closure. 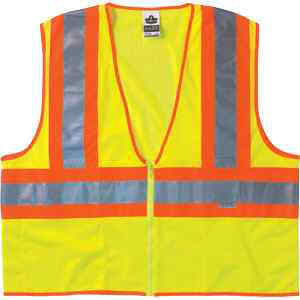 Made of durable, breathable, 3.3 oz ANSI-certified polyester mesh, the vest meets ANSI 107-2004 Class 2 standards.